The Dallas Police Department is asking for the public’s assistance to help identify a suspect regarding an aggravated assault offense. On November, 11, 2017, a suspect was leaving a restaurant located at 527 Sunset Avenue near West Jefferson Boulevard and South Llewellyn Avenue. The suspect described as a 40-year-old Hispanic male fired a handgun into a vehicle that was occupied by several individuals. 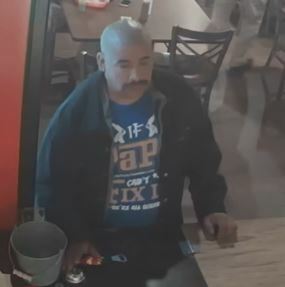 The suspect is described as 5’10 inches tall, weighing 250 pounds, bald with a mustache. If anyone can identify the pictured suspect, please contact Detective Hubner at 214-671-3639. Crime Stoppers will pay up to $5,000 for information called into Crime Stoppers that leads to the arrest and indictment for this felony offense and other felony offenses. The number for Crime Stoppers is: (214)373-TIPS (8477). Calls are accepted 24 hours a day, 7 days a week.